Snowpack in California’s Sierra Nevada in 2015 was at the lowest level in the past 500 years, according to a new report. The research is the first to show how the 2015 snowpack compares with snowpack levels for the previous five centuries. “Our study really points to the extreme character of the 2014-15 winter. This is not just unprecedented over 80 years — it’s unprecedented over 500 years,” said Valerie Trouet, an associate professor of dendrochronology at the UA Laboratory of Tree-Ring Research. “We should be prepared for this type of snow drought to occur much more frequently because of rising temperatures,” Trouet said. “Anthropogenic warming is making the drought more severe.” California’s current record-setting drought began in 2012, the researchers note in their report. On April 1 of this year, California Gov. Jerry Brown declared the first-ever mandatory water restrictions throughout the state while standing on dry ground at 6,800-foot elevation in the Sierra Nevada. The historical average snowpack on that site is more than five feet, according to the California Department of Water Resources. The lack of snow in 2015 stems from extremely low winter precipitation combined with record high temperatures in California in January, February and March, Trouet said. About 80 percent of California’s precipitation occurs in the winter months, she said. Snowpack level is generally measured on April 1 each year, a time when the snowpack is at its peak. “Snow is a natural storage system,” she said. “In a summer-dry climate such as California, it’s important that you can store water and access it in the summer when there’s no precipitation.” In past years the snows of the Sierra Nevada slowly melted during the warmer months of the year, and the meltwater replenished streams, lakes, groundwater and reservoirs. In a winter with less snow or with winter precipitation coming as rain rather than snow, there is less water to use during California’s dry summers…. Noah S. Diffenbaugh is an associate professor of earth system science at Stanford. Christopher B. Field is director of the department of global ecology at the Carnegie Institution for Science. STANFORD, Calif. — As wildfires rage, crops are abandoned, wells run dry and cities work to meet mandatory water cuts, drought-weary Californians are counting on a savior in the tropical ocean: El Niño. This warming of the tropical Pacific occurs about every five years, affecting climate around the globe and bringing heavy winter precipitation to parts of California. The state experienced two of its wettest years during two of the strongest El Niños, in 1982-83 and 1997-98. Now climatologists have confirmed that a powerful El Niño is building, and forecasts suggest a high likelihood that El Niño conditions will persist through the next several months. So we in California expect a rainy winter. But before everyone gets too excited, it is important to understand this: Two physical realities virtually ensure that Californians will still face drought, regardless of how this El Niño unfolds. Our research has shown that global warming has doubled the odds of the warm, dry conditions that are intensifying and prolonging this drought, which now holds records not only for lowest precipitation and highest temperature, but also for the lowest spring snowpack in the Sierra Nevada in at least 500 years. These changing odds make it much more likely that similar conditions will occur again, exacerbating other stresses on agriculture, ecosystems and people. At the same time, extreme wet periods may also increase because a warming atmosphere can carry a larger load of water vapor. In a possible preview, persistent El Niño conditions this year could force Californians to face both flooding and drought simultaneously. The more rainfall there is, the more water will be lost as runoff or river flow, increasing the risk of flooding and landslides. Add in the fact that the drought and wildfires have hardened the ground, and a paradox arises wherein the closer El Niño comes to delivering enough precipitation to break the drought this year, the greater the potential for those hazards. In the United States, we experienced more than 80 “billion-dollar” climate and weather disasters in the last decade, and several have cost much more. The regularity of these episodes and the resulting damage shows that we are not prepared for the current climate, let alone a changing one that portends more weather extremes. From these disasters, we can take away two lessons: Increasing resilience now can build protection for the future, and stressed systems are more prone to disasters. For instance, the risk from a period of extremely low water supply in California is far greater when high temperatures, like those we’ve seen here over the last two years, prolong drought. There are also risks when the combined demands of households, manufacturing, farming and ecosystems tax water supplies even in good years, or when forest management practices create conditions that fuel fires. Californians will benefit by reducing these interacting stresses. We are not arguing that the drought has been caused by climate change alone, or that all weather disasters have a link to climate change. However, the evidence is clear that many areas of the globe are experiencing increasing risks from weather and climate hazards. As with the California drought, climate change is an important thumb on the scale, increasing the odds of particular extremes in specific places. In California, we can expect warmer winters and hotter summers, drier dry years and wetter wet years, and less water storage from snowpack in the mountains, which also controls flooding. This means more years with extreme fire danger, critically overdrawn groundwater, legal water rights that exceed the amount of water available and challenges to balancing trade-offs among water storage, flood control and environmental protection. We have opportunities to rethink the fundamental structure of water rights and markets, re-engineer water storage to compensate for decreasing snowpack, update regulations and infrastructure to embrace water reuse and recycling, and regulate end-user pricing to encourage conservation. In short, we benefit from incorporating climate-related risks in planning for California’s future. Fortunately, California has many assets, including historical experience, robust institutions, sophisticated science and engineering expertise and financial flexibility. Capitalizing on these assets can reduce risks today and set a path for a vibrant future. Doing so will begin by acknowledging that we are already living in a rapidly changing climate. Photo: Paul Chinn, The Chronicle This year’s El Niño may be stronger that the version that hit California in 1997-1998 rainy season. Here are photos from the 1997-1998 El Niño: A storm-damaged section of the Great Highway south of Sloat Boulevard in March 2012. To predict future coastal hazards, it is important to quantify any links between climate drivers and spatial patterns of coastal change. However, most studies of future coastal vulnerability do not account for the dynamic components of coastal water levels during storms, notably wave-driven processes, storm surges and seasonal water level anomalies, although these components can add metres to water levels during extreme events. Here we synthesize multi-decadal, co-located data assimilated between 1979 and 2012 that describe wave climate, local water levels and coastal change for 48 beaches throughout the Pacific Ocean basin. We find that observed coastal erosion across the Pacific varies most closely with El Niño/Southern Oscillation, with a smaller influence from the Southern Annular Mode and the Pacific North American pattern. In the northern and southern Pacific Ocean, regional wave and water level anomalies are significantly correlated to a suite of climate indices, particularly during boreal winter; conditions in the northeast Pacific Ocean are often opposite to those in the western and southern Pacific. We conclude that, if projections for an increasing frequency of extreme El Niño and La Niña events over the twenty-first century are confirmed, then populated regions on opposite sides of the Pacific Ocean basin could be alternately exposed to extreme coastal erosion and flooding, independent of sea-level rise. Virtually every ecosystem of the world — from forests to the oceans — raises concern about the toll that a warming climate will take. There’s one type of landscape, though, that doesn’t get talked about very much in this context — so-called “drylands,” a grouping that includes arid and semi-arid regions ranging from many deserts to grasslands. Drylands are one of the more important ecosystems in the world, comprising fully 40 percent of the Earth’s land surface. And now, an alarming new study in the Proceedings of the National Academy of Sciences says the impact of a warming climate on these ecosystems could be much worse than expected — comparable to humans trampling the landscapes underfoot or driving off-road vehicles across them. “Contrary to our expectations, experimental climate change and physical disturbance had strikingly similar impacts,” wrote the researchers, led by Scott Ferrenberg of the U.S. Geological Survey’s Southwest Biological Science Center in Moab, Utah. Ferrenberg conducted the work with two Geological Survey colleagues…. In drylands worldwide, where plant cover is sparse, large amounts of the ground surface are covered by specialized organisms that form biological soil crusts (biocrusts). Biocrusts fix carbon and nitrogen, stabilize soils, and influence hydrology. Extensive physical disturbance from livestock/human trampling and off-road vehicles is known to destroy biocrusts and alter ecosystem function. More recent work also indicates that climate change can affect biocrust communities. Contrary to our expectations, experimental climate change and physical disturbance had strikingly similar impacts on biocrust communities, with both promoting a shift to degraded, early successional states. These results herald ecological state transitions in drylands as temperatures rise, calling for management strategies that consider risks from both physical disturbances and climate change. Governments’ interference in the natural cycle of fires, along with climate change, has created more brush on forest floors and hotter, drier seasons. The fire season of 2015 in the American West is shaping up as one of the worst in the nation’s history, with more than eight million acres burned nationwide — more than five million acres in Alaska alone. Fierce wildfires this month have destroyed hundreds of homes in California. The Forest Service struggles under an increasingly costly mission: According to a report released last month, firefighting takes up more than 50 percent of its annual budget, up from 16 percent a decade ago. In 10 years, it could consume three quarters of its budget. Climate change has lengthened fire seasons, which are, on average, 78 days longer than they were in 1970, and the six worst fire seasons since 1960 have come since 2000. The consequences of a century of forest policies to suppress fires are now combining with the hotter and drier seasons to create tinderbox conditions, producing high-severity fires that kill trees and are increasingly hard to bring under control. Dr. Allen and many other researchers have studied how to manage forests so fires are not as destructive. And in the case of the most destructive fires, they are studying what happens to those landscapes in the years after a blaze. In an increasing number of cases, said Malcolm P. North, a research scientist with the United States Forest Service Pacific Southwest research station in Davis, Calif., “after the satellite trucks leave and everyone goes home, you have a charred condition on the landscape that does not have a historical precedent.” Fire, over eons, has been an essential and cyclical part of forest life; tree-ring records show fires occurring every five or 15 years for ponderosa pine in the Southwest, said Thomas W. Swetnam, a professor emeritus at the University of Arizona and an expert in tree-ring analysis. The fires tended to burn with low intensity, clearing underbrush, grasses and seedlings, leaving an uncluttered forest floor and helping some species of pine spread their seeds. More than 100 years ago, that pattern of frequent surface fires was disrupted, first by widespread grazing by sheep and cattle, which cleared much of the grass and other undergrowth, and then by a government policy to suppress forest fires wherever possible. Fewer fires caused the forests to grow more densely, and for grasses and dead trees to accumulate on the forest floor. The hotter, longer droughts associated with climate change make the trees and ground cover drier; the result is a greater tendency for fires to “ladder up” to the canopy of leaves or needles above. Dr. North, the California researcher, said that as much as 80 percent of California’s forests were in the kind of conditions that were likely to lead to the more destructive, tree-killing fires. Without mature trees near the fire-ravaged areas to spread their seeds, brush and grass are likely to grow in place of the conifers. That means forest recovery can be slow, or worse, said Donald A. Falk, a fire expert at the University of Arizona. “That’s a recovery process that could take centuries — and given where climate is going, it might never recover,” he said. Not everyone agrees with this gloomy assessment. William L. Baker, a professor emeritus at the University of Wyoming, has used historical land-survey data to argue in papers that large, severe wildfires are a natural phenomenon and are not necessarily worse than before. Over time, he has argued, the forests can grow back. But Dr. Swetnam and others disagree with Mr. Baker’s conclusions, arguing that the land-survey records are not as reliable an approach to understanding fire history than the trees’ own rings, among other data sources. He added, “I’m often pressed to say which is the most important factor in the changing nature of forest fires. I’m more inclined now to point to climate change than I was 10 years ago.” A sweeping recent paper from Mr. Allen and colleagues suggests that wildfires are only part of the damage that climate change is wreaking on the world’s forests. The hotter droughts that are associated with climate change are causing stress for trees, and are likely to grow worse over time, leading to increased tree mortality. By the middle of this century, “If the climate models are at all accurate, what in 2011 were really extraordinary conditions will be typical conditions for June” in the Southwest, he said. A study published in July suggests this has occurred in California, where forests have shifted from net carbon absorbers to carbon emitters, according to Patrick Gonzalez, a forest ecologist with the national park service and the author of the report. An author for the Intergovernmental Panel on Climate Change, Dr. Gonzalez said that wildfires were “tipping the balance” between storage and emission. Even droughts that do not lead to tree death impair the ability of forests to absorb carbon dioxide. A study published in July from William R.L. Anderegg of Princeton University and colleagues has found that forests slow their growth for four years after a drought, and absorb less carbon during that period. Researchers in the past believed that forests recovered quickly, but Dr. Anderegg and his colleagues found that severe drought greatly curtailed the absorption of carbon over a broad range of tree species. “It’s absolutely clear that drought has these manifold and very severe impacts on forests,” Dr. Anderegg said. “Forests are more vulnerable than we thought. Drought has lasting impacts, even when the rain comes back and the soil becomes wet again.” So far, he said, the world’s forests appear to be a net absorber of carbon, but there are “some worrying signs that we could be starting to change that.” He added, “We could be in more danger than we thought, sooner than we thought.” Fire experts have long called for action to meet the challenge of forest fires in a changing climate. The problem with controlled burning, Mr. Allen said, is that the century of fire suppression has created forests that can readily burn out of control. “We were trapped in this Catch-22,” he said. But such thinning, he said, is nonetheless essential. Restoring forests that have burned is also expensive, Mr. Allen said, and not always effective. After the Los Conchas fire in 2011, the federal government announced a program to plant 5,200 acres of trees – a large number, though still just a fraction of the 150,000 acres of land that were burned. The seedlings, planted during a severe drought, also did not fare well; most died. During the warmer months, the air surrounding California’s rivers and streams is alive with the flapping of wings and chirping of birds. But once the buzz and breeding of spring and summer are over, these riparian areas grow quiet. Sometimes it seems as though there are hardly any birds there at all. Not so, according to a study from the UC Davis Department of Wildlife, Fish and Conservation Biology. Researchers examined bird diversity in the lower Cosumnes River and lower Putah Creek watersheds in the Central Valley between 2004 and 2012. They found that just as many bird species used the riparian habitats in the winter as in the summer, and genetic diversity was actually higher in the winter than during summer months. It turns out that while many birds headed south for the winter to tropical habitats, birds that breed in the boreal forest of Canada flew in to take their place. These “neotemperate migrants,” as the researchers call them, include birds such as the yellow-rumped warbler, white-crowned sparrow, fox sparrow, cedar waxwing, and varied thrush. “You might have to look harder, but there are just as many species there,” said lead author Kristen Dybala, a UC Davis postdoctoral student at the time of the study and currently a research ecologist with Point Blue Conservation Science. 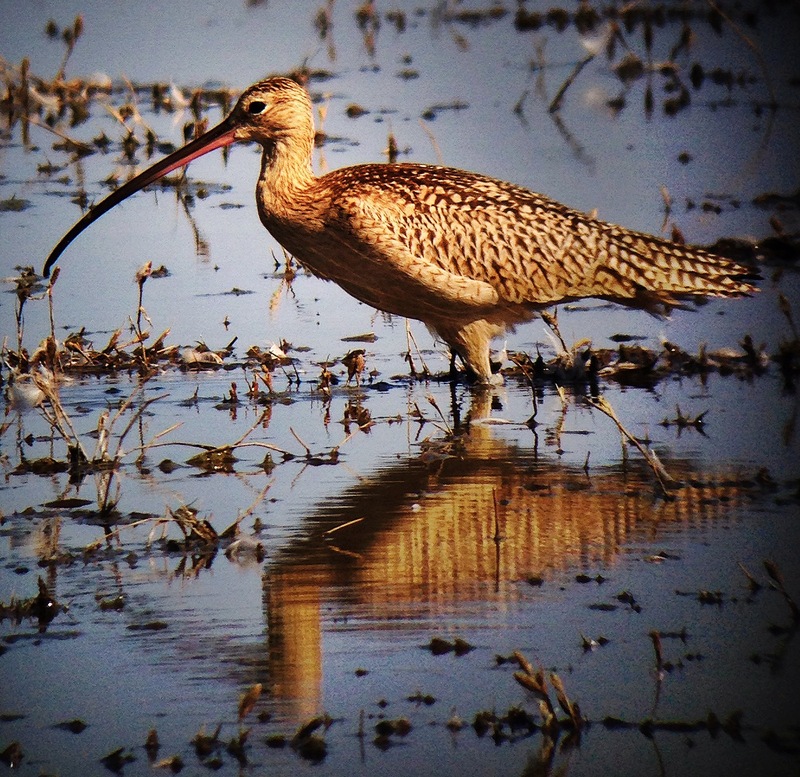 “We found strong evidence that Central Valley ecosystems are very important in supporting bird populations throughout the year.”…. Article first published online: 18 SEP 2015 DOI: 10.1111/1752-1688.12353 © 2015 American Water Resources Association Paper No. JAWRA-14-0153-P of the Journal of the American Water Resources Association (JAWRA). We used Landsat satellite imagery to (1) quantify the distribution of open surface water across the Central Valley of California 2000-2011, (2) summarize spatio-temporal variation in open surface water during this time series, and (3) assess factors influencing open surface water, including drought and land cover type. We also applied the imagery to identify available habitat for waterbirds in agriculture. Our analyses indicated that between 2000 and 2011 open surface water has declined across the Central Valley during the months of July-October. On average, drought had a significant negative effect on open surface water in July, September, and October, though the magnitude and timing of the effect varied spatially. The negative impact of a drought year on open water was experienced immediately in the southern Central Valley; however, there was a one year time-lag effect in the northern Central Valley. The highest proportion of open surface water was on agricultural lands followed by lakes, rivers, and streams, yet the relative proportions varied spatially and across months. Our data were consistent with previous descriptions of waterbird habitat availability in post-harvest rice in the northern Central Valley. Tracking water distribution using satellites enables empirically based assessments of the impacts of changing water policy, land-use, drought, climate, and management on water resources. This fall, birds migrating south from the Arctic will find 7,000 acres of new, temporary wetland habitat for their stopovers in California. The wetlands – rice fields shallowly flooded for a couple weeks after the harvest – are courtesy of a project that combines citizen science, conservation groups and imagery from Landsat satellites, a joint NASA and U.S. Geological Survey program. The BirdReturns program, created by The Nature Conservancy, is an effort to provide “pop-up habitats” for some of the millions of shorebirds, such as sandpipers and plovers, that migrate each year from their summer breeding grounds in Alaska and Canada to their winter habitats in California, Mexico, Central and South America. The solution involves big data, binoculars and rice paddies. The Cornell Lab of Ornithology’s eBird program collects on-the-ground observations, including species and date spotted, from bird watchers nationwide. With a recent NASA grant to Cornell, scientists created computer models to analyze that information and combine it with satellite remote sensing imagery from Landsat and the Moderate Resolution Imaging Spectroradiometer instruments on NASA’s Terra and Aqua satellites. With these models, they could identify areas in the Central Valley where birds flocked to during the spring and fall migrations, as well as estimate the number of birds making the journey. “The challenge then was to better understand the status of the habitat, where the models were predicting we should have birds,” Reynolds said. Some of his colleagues had been using Landsat images to look at where – and when – there was standing water, to assist with surveys of shorebirds. Matthew Reiter, a quantitative ecologist with the conservation science nonprofit Point Blue, based in Petaluma, California, worked on developing models that can classify habitats based on Landsat imagery. For the BirdReturns project, the team analyzed 1,500 Landsat scenes between 2000 and 2011, and then additional images from Landsat 8 after its 2013 launch. For each area not blocked by clouds, they classified whether there was surface water. “We can show patterns of how there’s changing habitat availability through the year, and that the timing may vary year to year,” Reiter said. S.L. Marcus suggests that our paper “Ice Melt, Sea Level Rise & Superstorms: evidence from paleoclimate data, climate modeling, and modern observations that 2°C global warming is highly dangerous” would have greater appeal and impact if it featured some notable, verifiable predictions. In related vein, E. Stabenau asks what observations in the next decade or so would verify our assumptions. Indeed, there are many predictions implicit in our paper, and there is merit in highlighting these. Most revealing, in stark contrast to all IPCC models, is strong cooling of the Southern Ocean surface and in the North Atlantic, as shown in Fig. 1. These coolings are a consequence of fundamental processes induced by injection of meltwater into upper layers of the ocean. Cooling of the Southern Ocean and North Atlantic results mainly from the stratification effect of freshwater. Lesser density of fresh meltwater, compared to salty ocean water, reduces sinking of surface water to the deep ocean. Reduced Antarctic Bottom Water formation reduces the amount of relatively warm deep water rising to the surface, where it increases heat flux to the atmosphere and space. Instead heat is kept at depth, raising deep water temperature and melting ice shelves (see diagram in Fig. 22 of our paper). (1) Global surface temperature. Our paper makes clear that the United Nations choice of 2°C as a “guardrail” is not justified by the science, indeed global mean temperature is a flawed metric for that purpose. However, surface temperature is a good diagnostic of the climate system, and, as discussed above, Southern Ocean and North Atlantic temperature patterns will provide an indication of the effect of ice melt on the Southern Ocean and North Atlantic overturning. (2) Earth’s energy imbalance. The planet’s energy imbalance provides a simple measure of where climate is headed. We must eliminate this imbalance to stabilize climate, and perhaps we will need to achieve a slightly negative imbalance for the purpose of cooling the ocean and avoiding demise of ice shelves and the ice sheets…. (3) Atmospheric CO2. Atmospheric CO2 amount is a critical measure of the state of the planet, which governments apparently prefer to ignore, perhaps because they do not like its implications…. The need to restore Earth’s energy balance informs us about the required limit on greenhouse gases (GHGs), specifically that the CO2 stabilization level cannot be as high as 450 ppm or even 400 ppm, the present amount. Instead it is no more than 350 ppm and possibly lower12, which has immediate implications for policy. (4) Sea level à ice sheet mass change. Most large cities are located on coast lines. Multi-meter sea level rise has the potential to wreak global economic havoc, create hundreds of millions of refugees, and thus perhaps make the world practically ungovernable….However, large ice sheets are the source of potentially disastrous sea level rise and it is important to measure their rates of change accurately on a regional basis. Thus a critical measurement is continuation of precise gravity measurements from satellites. (5) Aerosols. Measurements of the largest climate forcings affecting Earth’s energy imbalance are needed for policy prescription. Greenhouse gases are monitored, but the other large human-made forcing, aerosols, including effects on clouds, are not monitored….Analogous to gravity measurements, precise aerosol measurements would be done best from a small satellite, thus making continuous or near -continuous monitoring feasible. Now let us return to the question: is it already too late? The conclusion that dangerous climate change is reached at global warming less than 2°C, and that it will be necessary to reduce CO2 back below 350 ppm, makes clear how difficult the task will be. The bright side is the fact that the climate forcing limitation required to avoid sea level disaster is so stiff that it should also avert other climate impacts such as AMOC shutdown. Furthermore, we would roll back undesirable climate impacts that are already beginning to appear. There is a misconception that slow feedbacks associated with climate forcings already in place will have unavoidable consequences. Most slow feedbacks will never occur, if we succeed in restoring Earth’s energy balance. Restoration can be aided by reducing non-CO2 forcings. However, the dominance of CO2 in present climate forcing growth, and the long life of fossil fuel carbon in the climate system, demand first attention on phase-out of fossil fuel emissions…..